Hearts are some of the most recognizable and prominent symbols associated with the series; one type of heart symbol is featured on the series logo and, as a result, on the majority of real-world Kingdom Hearts merchandise. The symbol also appears on the back of every Card, Limit Form's outfit in Halloween Town, in several worlds, such as Hollow Bastion, The World That Never Was, Traverse Town, and Radiant Garden, and several Keyblades and miscellaneous weapons. Simplified heart symbols appear less frequently, but are featured in Trinity Marks, several Keyblades, Wonderland, typically with the Queen of Hearts, and, most notably, the heart-shaped moon, Kingdom Hearts. A few Pureblood Heartless have heart-shaped holes in their chests. The most recognizable heart symbol is depicted as the outline of a heart with tips that curl inward at its top. More simplified heart, solid designs also appear in the series, although they are featured less prominently. The Heartless symbol is used, as its name suggests, to represent the Heartless, specifically Emblem Heartless. The standard Heartless emblem is displayed on every single Emblem Heartless, as well as Ansem, Seeker of Darkness's chest and certain weapons related to Heartless, such as the Akashic Record and Precious Mushroom. In the End of the World, the doorway leading to the Final Rest area is shaped like the Heartless emblem. The Heartless emblem without the spiked "X" is commonly associated with Riku. When using Dark Mode, Riku wears the symbol on his chest, and it is the Keychain token of his main Keyblade, Way to the Dawn. The Keychain token of the χ-blade is a black and red heart resembling the Heartless emblem, but with two Kingdom Keys crossed over it in place of the normal red design. In the World of Chaos fight, the arena is shaped like a blue Heartless insignia. The Heartless emblem is comprised of a heart with a fleur-de-lis at its base. It is typically black with a red outline and spiked "X" crossing through the heart in the symbol, which symbolizes the fact that Heartless act without emotions, hence their name. A common variation of the Heartless emblem is a completely black silhouette, lacking the cross over the heart. A third variation is simply a heart featuring the color scheme of the standard Heartless symbol, a black body and red outline, but also lacks the cross. The Bug Blox have symbols on each side of their bodies. They resemble circles connected by some lines, representing the corrupted nature of the digital bugs. The Nobody symbol (ノーバディのマーク?) is primarily associated with Organization XIII and the Nobodies it commands, and many of the members' weapons incorporate the symbol into their design. Every single lesser Nobody is emblazoned with the Nobody symbol, and a few are even shaped like it. The Proof of Nonexistence, Challenge Sigil, Unity Badge, and Ordeal Badge all feature the symbol. Certain accessories with connections to Organization XIII, such as the Full Bloom and Shadow Archive, also use the symbol. The symbol is featured countless times in the architecture and decorations of the Castle That Never Was and other areas related to the Organization. Two Become One is the only Keyblade to sport the full Nobody emblem in its design. A variant of the Nobody emblem based on the original's top half appears on several Gummi Nobodies. The Nobody emblem resembles an upside-down Heartless emblem in shape, but with several circular notches taken out of its edges. The symbol's base is shaped like an upside-down heart, while its top is a thin, spiked cross. Spikes and sharp edges often evoke the Nobody emblem without the full symbol being displayed. The symbol is usually depicted as white or silver, like most Nobodies. Xemnas created the symbol based on Terra's fragmented memories, and, as a result, the Nobody emblem bears a strong resemblance to Terra's mark. The Unversed emblem is emblazoned at least once on every single Unversed, with the exception of the Flood. After Vanitas forcibly merges with Ventus, Ventus's Dive to the Heart Station changes appearance, incorporating Unversed emblems into Vanitas's half of the pillar. The black coat bears a silver Unversed symbol on its zipper. The Unversed emblem is designed to resemble a heart expressing emotion. It uses sharp corners, deep curves, and straight edges to form a heart shape in its center. Certain parts of the Unversed symbol's design resemble some Unversed's eyes. The symbol is nearly always black. The Dream Eater emblems appear on almost every Dream Eater. The Dream Eater symbols are designed in the form of hearts with certain aspects that display whether they are Spirit or Nightmare. The Spirit variant is always a faded pale peach fading to a deep hot pink with a dark purple border, the tail at the bottom of the heart-shaped is bowl-shaped. Its wings are shaped more like swirls as it is given a simplistic innocent look, compared to the Nightmare version. The Nightmare variant is always colored a deep navy fading into a bright neon purple with a thick white border, the tail at the bottom of the heart-shaped symbol is cone-shaped. Its wings are shaped like bat wings with small spikes in the center and growing larger near the sides. They bear a very vague resemblance to the Heartless symbol, specifically the Nightmare version. Due to his nature within Sora's dreams as a Dream Eater, Riku has the Spirit emblem on the back of his vest during most of Kingdom Hearts 3D: Dream Drop Distance. Terra, Aqua, and Ventus wear an emblem on their clothes as badges. While it is not uniquely associated with Terra, and appears to be a signature of Keyblade wielders that train in the Land of Departure, it is referred to as "Terra's Mark" (テラたちのマーク, Tera-tachi no Māku?, lit. "The Mark of Terra and his friends") in official materials. Master Eraqus wears the emblem on his armored chest piece, and it is also the Keychain token of his Keyblade. Aqua's Wayfinders have the emblem in their centers. Terra's mark is featured on several Dive to the Heart Stations, including two of Ventus's Stations and the character selection screen of Kingdom Hearts Birth by Sleep. It also appears on the walls of the Chamber of Waking. Terra's mark resembles the Heartless and Nobody symbols in shape; it is a heart with a sharp cross at its base. The symbol is very angular and squared, and the points of its cross are much more compact and close together than those of the Nobody symbol. The symbol appears in several different colors, such as gold and silver. Crowns are another heavily featured symbol of the series and are part of the Kingdom Hearts logo along with the curled heart symbol. Sora notably wears a silver crown necklace in most of his forms and can in fact wear a crown in Kingdom Hearts II Final Mix. Puzzle pieces and Mission Crowns are represented by golden crowns. Limit Form and, in Halloween Town, Final Form, is represented by crowns. The tops of the cards used in Castle Oblivion are shaped like the standard crown, and are featured on the front of some cards. The Crown-G, the Keychain token of the Oblivion, accessories such as the Draw Ring, the Save the King shield, and the Ultima Weapon all incorporate crowns into their designs. Every one of Sora's Dive to the Heart Stations feature crowns. A large, glowing crown appears underneath Sora when he unlocks a World Gate. The most widely used crown symbol in the series is a flat, three-pronged crown that appears in a wide variety of colors, most commonly gold and silver. The shape of the crowns prongs create a negative space silhouette of the Kingdom Key's teeth. Strategy guides for the series occasionally use a yellow symbol that could be a crown viewed from above. This symbol is a ring with spikes along its outer edge and an "X" in its center, and is used to represent characters and enemies that cannot be classified as Heartless, Nobodies, Unversed or Dream Eaters. Every world has a Keyhole that leads to its heart and can be locked by the Keyblade. Locking all of the Keyholes is Sora's primary objective in the original Kingdom Hearts. In Kingdom Hearts II, Sora seeks out and unlocks Gates, which are represented by large, glowing keyholes. When the χ-blade was destroyed, it released several small, glowing keyhole symbols, but it is unclear what significance this has. The Wonderland Doorknob's mouth is a Keyhole. The Keyhole symbol is normally depicted as a simple silhouette of an old-fashioned keyhole, one that a skeleton key could unlock. Keys are recurring symbols in the series, mainly through the use of the Keyblade by the main characters. The simplified key symbol is used to represent physical attacks with the Keyblade in the Command Menu and Command Deck and similar menus. Excluding the many different forms that Keyblades take, the common key symbol resembles a simplified Kingdom Key. The Kingdom Key, in turn, is modeled after a skeleton key, a type of key that was designed to open any lock. "As your flesh bears the sigil, so your name shall be known as that...of a recusant." —Xemnas to Sora, at the beginning of their battle. Chi is the twenty-second letter in the Greek alphabet, from which the Latin letter "X" is derived. Master Xehanort can form a glowing, stylized version of the letter in his hand. According to him, χ is "a most ancient letter" that represents death and endings, and it can be pronounced "kye" or "key". The letter χ lends its name and form to the χ-blade, which features two Kingdom Keys crossed in an "X"-shape on the blade and Keychain token. Xemnas adds a similar-looking "X" known as the Recusant's Sigil (異端の印, Itan no shirushi?, lit. "Mark of heresy") to the names of all members of Organization XIII. This is because he vaguely remembers Master Xehanort's fascination with the χ-blade. According to Young Xehanort, the Recusant's Sigil can be used to track a person's location once he or she has been marked with it. During his Mark of Mastery exam in the Sleeping Worlds, Sora is marked with the Recusant's Sigil by Ansem, Seeker of Darkness so that the other incarnations of Xehanort can keep an eye on him. The Recusant's Sigil appears on Sora's shirt in the form of a silver "X." The designs of Terra, Aqua, and Ventus's outfits were each inspired by the Latin letter "X." Stars are frequently-seen symbols in the series and are often associated with the various Worlds in the Kingdom Hearts universe. Stars in the night sky are actually other, distant Worlds. Stars fade out when the corresponding world has been destroyed; the disappearance of many stars is what prompted King Mickey to find a way to stop the Heartless, beginning the events of the original Kingdom Hearts. An artifact called the Star Shard allowed for transportation from one World to another, albeit randomly. Several accessories and Keyblades incorporate stars into their designs, such as the Star Seeker. paopu fruit are star-shaped fruit which supposedly create bonds between friends that can span many different Worlds. Wayfinders, lucky charms modeled after paopu fruit, have a similar reputation. The Wayfinders made by Aqua in Kingdom Hearts Birth by Sleep manifest these bonds of friendship physically, in the form of the Dimension Link system. Paopu fruit and Wayfinders are featured in the designs of several important Keyblades, including the Ultima Weapon and Oathkeeper. Yen Sid's powerful sorcerer's hat is adorned with several stars and moons. In Kingdom Hearts χ [chi] Lux, a form of light, is introduced that together with the related Crystals of Light are also star-shaped. Additionally, every Keyblade releases a unique star when hitting an object or enemy. Even in the real world, the fleur-de-lis is an extremely old and widespread symbol. It is a stylized flower, specifically a lily or iris, with a diverse range of meanings, but it has been most commonly associated with royalty or purity, and is the symbol of the French monarchy. Within the Kingdom Hearts series, the fleur-de-lis appears on several accessories and weapons, such as the Master Ring and Midnight Roar, the door to Timeless River, various areas and uniforms in the Country of the Musketeers and two Dive to the Heart Stations: one of Ventus's Stations and the Station displaying silhouettes of Alice, Jasmine, and Kairi. A standard fleur-de-lis is used to represent Valor Form, while a stylized version of the symbol—one shaped like an "X"—represents Master Form. The Old Mansion features a unique symbol that combines the crown, heart, and fleur-de-lis symbols. In Traverse Town, the fleur-de-lis symbol appears as a huge sign for the Accessory Shop. During his time in Twilight Town, Roxas wears a jacket with a distinctive, X-shaped zipper pull. The zipper pull is modeled after the Nobody symbol, specifically the notched cross that comprises the Nobody emblem's top half, and hints at Roxas's background. The symbol is also the Keychain token of the Two Become One Keyblade, which is directly connected to Roxas. Similar symbols are often used to evoke the Nobody sigil, such as in Saïx's Lunatic Claymore and Larxene's Foudre Knives. The silhouette of Mickey Mouse's head is frequently used to represent not only Mickey himself, but Disney as a whole. Disney Town and Disney Castle feature the symbol heavily, and three of the many craters in the Keyblade Graveyard form the silhouette as well. The symbol is also incorporated into the Trinity Limit circle, Gimmick Cards, and certain weapons such as the Dream Sword. It serves as the Keychain token for the Kingdom Key, Kingdom Key D, Kingdom Key W, Braveheart, and Victory Line Keyblades. King Mickey uses the symbol to seal all of his official letters. In the Sleeping Worlds, La Cite Des Cloches, The Grid and Prankster's Paradise are arranged to make up a Hidden Mickey. In Kingdom Hearts III, the symbol appears across nearly all worlds in the form of Lucky Emblems. While some are true Hidden Mickeys formed by items lining up properly into shape, others are simply the image of the symbol stamped onto the surroundings. In the real world, Disney places Hidden Mickeys in many of its properties, including Disney theme parks and scenes in many Disney movies. The symbol of the Book of Prophecies appears embossed on the cover of the titular book. Similar in design to Terra's mark and the Nobody symbol, it is an ornate heart with an elongated spiked cross at the bottom. The sides consist of a single angelic wing, and a demonic wing - representing light and darkness, respectively. In the epilogue to Kingdom Hearts III during a flashback scene, Eraqus teaches Xehanort a new game played with seven black pieces and one white piece. The white piece represents Sora, while six of the black pieces represent the Foretellers and Luxu. The center black piece represents The Master of Masters, adorned with the symbol of the Book of Prophecies. The Gazing Eye (見つめる目, Mitsumeru Me?) 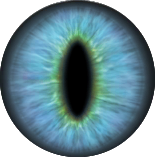 is a blue eye with a cat's eye iris which belongs to the Master of Masters. He placed it within his Keyblade, then asked Luxu to pass it down from apprentice to apprentice, eventually reaching Xehanort in order to have it observe its surroundings throughout the eons and pass those back to the Master in his own era. The eye itself is present in both forms of this Keyblade, Master Xehanort's Keyblade and Young Xehanort's Keyblade, while the symbol appears on the Keyblades or Keychain tokens of his other apprentices, the Foretellers, as well as those of Xehanort: Vanitas's Void Gear, Terra's Chaos Ripper and Darkgnaw, Riku's Soul Eater and Way to the Dawn, Riku and Sora's End of Pain, and Ansem's dual Soul Eater polearm. A pink variation of the Gazing Eye is also present in Zexion's illusory copy of the Soul Eater. The Ultimania strategy guides use miscellaneous symbols not used anywhere else to represent certain important characters. Kairi's symbol is made of three small circles superimposed over a thin cross. Naminé is represented by a white flower superimposed over a black four-pointed star, and resembles Roxas's symbol. Both Donald and Goofy are represented by stylized crosses; Donald's is formed by four silhouettes of his mage's hat, while Goofy's seems to be based on the Hidden Mickey symbol on his shield. Jiminy Cricket and Pluto's symbols are X-shaped and formed by crossed silhouettes of umbrellas and bones, respectively. Ansem the Wise's symbol is based on the odd, squared cross shape formed by the front of DiZ's cloak. Pete is represented by a stylized silhouette of his own head, and Maleficent's symbol is a cross formed by four silhouettes of her horned hood. Pete has an additional symbol, a coat of arms seen above his door to Timeless River. The coat of arms is a grayscale shield adorned by the same stylized symbol of Pete's head, two arms with closed fists along the top, a letter "P", a cigar, and another closed fist at its base. Vanitas's crest is depicted as two halves of a gear arranged in an "S" shape, and appears on his and Ventus's fused Dive to the Heart Station, as the Keychain token for both versions of the Void Gear, and on the portal that initiates the battle with the Vanitas Remnant. Each Organization XIII member has a symbol displaying a black silhouette of his or her exclusive weapon. For members that carry multiple weapons, such as Xaldin, only the silhouette of one weapon is shown. However, both of Roxas's Keyblades and three of Larxene's Knives are silhouetted on their personal panels. Xemnas is the only member whose primary weapons, the Interdiction Ethereal Blades, are not silhouetted. Instead, Xemnas is represented by the silhouette of the shield used by his dragon form. The symbols are used like tombstones to represent each member in Proof of Existence and the Garden of Assemblage. Whole Worlds are represented by simple symbols of their own that appear in the screen fade when transitioning from one room to the other in the appropriate World. 100 Acre Wood is represented by one of Winnie the Pooh's honey pots and is also seen on the Honey card. Genie's magic lamp not only represents Agrabah and the Ancient Highway, but is also the Keychain token of Three Wishes and Wishing Lamp. The musical notes represent Atlantica and Splash Island. The Beast's rose represents his castle, Stardust Sweep, and is also featured in Belle's Dive to the Heart Station and the Keychain tokens of Divine Rose and Rumbling Rose. Cinderella's glass slipper represents the Castle of Dreams and is the token of the Stroke of Midnight. A fleur-de-lis symbolizes Country of the Musketeers, in a similar style shown on Mickey, Donald, and Goofy's outfits; it also makes up the teeth of All for One. Deep Space is represented by Stitch's paw print. The Dwarf Woodlands are represented by one of the Queen's poisoned apples. The Enchanted Dominion is represented by a royal standard with some of Maleficent's thorns coiling around it. A pumpkin symbolizes Halloween Town and is the Pumpkinhead's Keychain token. La Cité des Cloches is represented by one of the titular bells within Notre Dame, which is also the Keychain token of the Guardian Bell. Yen Sid's magical sorcerer's hat represents his Mysterious Tower. In Kingdom Hearts Birth by Sleep, Neverland is represented by the silhouette of Skull Rock. Olympus Coliseum's symbol—a cloud with a lightning bolt striking from it, a reference to Zeus—appears on many different objects. It appears on the Phantom Storm Gummi Course, the Olympus Stone, Herc's Shield, and is the Keychain token of all three Keyblades that are obtained in the World; Olympia, Hero's Crest, and Mark of a Hero. Port Royal and the Floating Island are represented by a skull and crossbones, a symbol commonly associated with pirates. Prankster's Paradise is represented by the profile of Pinocchio's head. The symbol also appeared on the book in the beginning of his original movie. The Pride Lands and Sunlight Storm are both represented by Rafiki's cave painting of a young Simba, and a different version of the symbol is the Circle of Life's Keychain token. Tron's Identity Disk is the Keychain token of the Photon Debugger and the symbol of Space Paranoids. The Grid is represented by a TRON: Legacy era Identity Disk. Symphony of Sorcery is represented by a musical note and a star twinkle. The Land of Dragons and Asteroid Sweep are represented by a generic Chinese pattern, which also appears on several Heartless in the World. Traverse Town is represented by the Reapers' logo from The World Ends with You in Kingdom Hearts: Dream Drop Distance, due to the Reapers' game taking place there. Wonderland is represented by a spade in Kingdom Hearts 358/2 Days - one of the four suits of cards - which also appear on the Card of Spades and the Lady Luck. In Kingdom Hearts χ [chi], the head of the Cheshire Cat is used instead. System Sectors are represented by the Bug Blox corrupting them. The Realm of Darkness is symbolized by a swirl of darkness. The Timeless River is symbolized by a circle, representing the iris shot technique characteristic of cartoons, as well as silent films and certain post-silent era comedies. Some important recurring symbols in the series are occasionally compiled into larger ones and used for a few specific events. A symbol from one of Naminé's drawings in the Old Mansion—a compilation of the Nobody, Heartless, and standard crown symbols—is used to gain access to Ansem the Wise's laboratory in the virtual Twilight Town. Two more compilations—one of the Nobody, Heartless, and "Other" symbols, the other of the standard crown and heart symbols, as well as the Nobody emblem and Roxas's zipper pull—are used in the Ultimania. The Trinity Limit circle is a compilation of small heart symbols, fleur-de-lis symbols, and Mickey Heads. ↑ Kingdom Hearts Birth by Sleep Ultimania, Interviewer: "Where did the Organization's coat and mark come from?" / Tetsuya Nomura: "One year after Birth by Sleep, Xehanort, as well as five other apprentices toss aside their hearts. Then the Nobody Xemnas was born, and the Organization which he creates take a lot of things from his memories, as a human. But as Xemnas had two people who he was, Terra and Master Xehanort, he takes from both of their memories. [...] The Nobody mark used by the Organization is a similar shape to the mark Terra used." Translation via Lissar. ↑ Kingdom Hearts Birth by Sleep Ultimania, Interviewer: "Was it easy to decide on the design for the three main characters?" / Tetsuya Nomura: "No, it was actually pretty difficult. Especially since all three of them would change into armor, when I began to work on their design I had decided that they would hit a round device to change into the armor. But how I could incorporate that device into their clothing was pretty difficult to decide. Also, since one of the secret keywords in the story is "X", I decided that I had to put that somewhere in the design of their clothes." Translation via Lissar. This page was last edited on 27 March 2019, at 06:31.